In the 1980s, renowned artist Mr. Han Meilin visited Yinchuan in Ningxia for the first time, a place famed as the "Frontier Land of Abundance". He was enormously moved by the ancient mystery of the rock paintings in the Helan Mountains. After this, Mr. Han Meilin made seven visits to the location, observing and learning about the rock painting art and gaining inspiration to further improve his artistic creations. The rock paintings in the Helan Mountains have thus been viewed by Mr. Han Meilin as an important turning point for his artistic work. In June 2010, with deep felt sentiments and intentions of gratitude, Mr. Han Meilin decided to donate 1,000 of his exquisite artworks completed over decades to the Yinchuan Municipal People's Government. To store, display, and research these treasured works of art, the local municipal government decided to establish the Yinchuan Han Meilin Art Museum within the Helan Mountain Rock Art Heritage Park. The aim has been to provide explanation and interpretation of the Helan Mountain Rock Paintings through the contemporary artistic forms of Mr. Han Meilin, making the ancient rock art more intuitive and more accessible to the public. The approach has opened up an all-new integrated path between ancient rock paintings and new fashion. On September 26, 2015, the Yinchuan Han Meilin Art Museum was officially opened, and another very worthy travel destination was added to the popular tourist belt around the Eastern Foot of the Helan Mountains. This is the third museum opened in China focused on Mr. Han Meilin following the ones in Hangzhou and Beijing. The size, number of exhibit pieces, and range of artistry of these three museums, located respectively in China's north, south, and west, can truly be described as unprecedented both in China and abroad. The Yinchuan Han Meilin Art Museum is located within the culture and art exhibition area of the Helan Mountain Rock Art Heritage Park and covers an area of 15,868 square meters. With a floor area of 6,694 square meters, the museum primarily includes the exhibition, interaction, creativity and tourist services sections, offering multifunctional services for touring, learning, exhibiting, and leisure. The museum features an entry hall, 4 galleries, the Sunshine Gorge, and a design sketch corridor, displaying over 1,000 items. A focus of the exhibits are the paintings, calligraphy, sculptures, ceramics, and dyed textiles in various artistic presentations of Mr. Han Meilin themed around rock paintings. 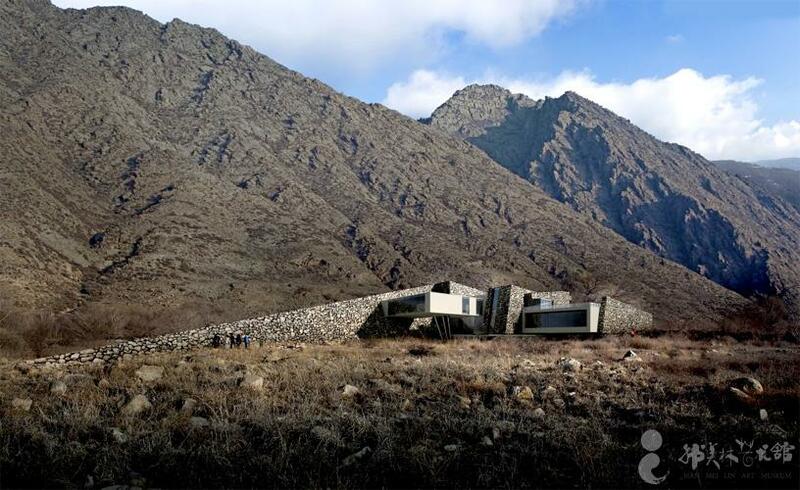 The museum's building design is inspired by the enormity of the Helan Mountains, as well as the building heritage of local residents suited to local conditions. The art museum's exterior appearance and construction is entirely integrated with the Helan Mountains, meticulously embedding sites and spaces as a conjoined whole. The properly square main hall and more open and spacious interaction area are organically integrated. By introducing sunlight and mountain vistas into the pluralistic space, a truly perfect combination has been attained between spatial function and form. The exterior of the art museum is decorated with ashlar, all of which is sourced from the Helan Mountains region. It is currently Yinchuan's highest building with exterior of ashlar and also intimates a kind of dialogue between modern art and nature.